Thunder IV: Tusker is a remarkable tale of bravery and sacrifice, written by Erik Daniel Shine and Melissa Davis. In an incredible glimpse at life in the animal kingdom, Thunder IV: Tusker examines the sadistic world of poaching, as seen through the eyes of those which are too often targeted by the human monsters (uprights) which devastate their world. After Tusker the elephant hears an animal scream in pain, he quickly and quietly ushers the younger animals to safety before seeking out the wounded creature. Tusker discovers Gamba, an eagle, caught in a trap. After freeing Gamba, Tusker is quickly targeted by the uprights who hope to lay claim to his mighty ivory tusks, landing them a hefty fee. Tusker’s only hope lies with his friends and his family... if only he had a way to get word to them. In the meantime, he must do all he can to try to stay alive. I could not help but become fully immersed in the intrigue behind the story line of this heartbreaking adventure. While rooting for Thunder to find a way to make it back to his family in one piece, I felt every harsh emotion wash over me as such a gentle and kind creature faces an uncertain future. Erik Daniel Shine and Melissa Davis state a rather urgent lesson to be learned: it is important to know the past if you are to survive each day to come. So many different animal species are featured in this engaging tale. Whether good or evil, each animal must decide if the risk to themselves is worth trying to save a mighty elephant which has done so much for so many. Friendships are put to the test, as is the loyalty of those whom Thunder has seen as trustworthy in the past. With not just his own life at stake, but also the lives of his family, readers will be unable to tear themselves away from this heartrending tale filled with emotional upheaval. 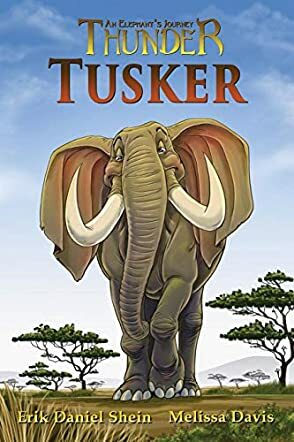 I very much enjoyed each turn of events in Thunder IV: Tusker, and wholeheartedly recommend it to readers aged 12 and over, so that they can see how poaching affects those in the animal kingdom so severely. With luck, many animals will survive to see another day.